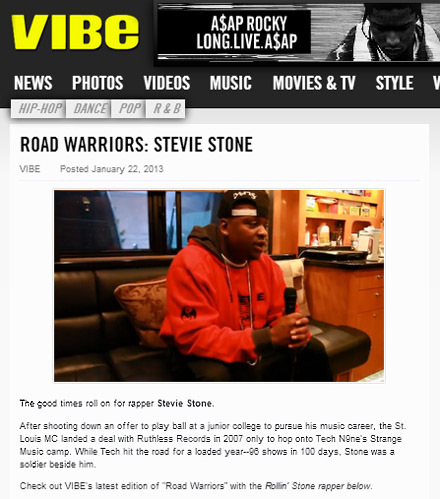 VIBE Magazine‘s Road Warriors web-series kicked off with a feature on the Rollin Stone himself! In the feature, the VIBE crew caught up with Stevie while on the Hostile Takeover Tour last year to discuss how he came to be a Strange Music artist, what he’s learned on the road so far, and more! With Stevie Stone hard at work on his upcoming album 2 Birds 1 Stone and tour rumors on the horizon, we’ll soon get to see all of the knowledge Stevie’s acquired put into action! Click HERE to watch the full episode of Road Warriors! What did you think of episode 1 of the series? Who do you hope to see on Road Warriors next?